"Wouldn't it be funny if that was true?" - Tennessee Williams, "Cat on a Hot Tin Roof"
Great art has a boomerang effect that is hard to match in other disciplines of human endeavor. Once something of artistic density is created it permeates time, culture, and progress. There are the usual attempts by those whose foresight is driven by the wallet (and this does not necessarily preclude the artist, in fact, in most cases is highly motivated by him) to rearrange its brutality to create a more palatable or sellable franchise. Thus is the pedigree of Tennessee Williams' most accessible ensemble piece, "Cat on a Hot Tin Roof", a Broadway revival of which now plays at the Richard Rogers Theater. Its eviscerating themes of casual mendacity, psycho-sexual anguish, overt greed and pomposity, and a crushing fear of mortality have swooped back to confront a 21st century audience with the subtlety of a jackhammer. Truth be told, I had no desire to see it this time around. 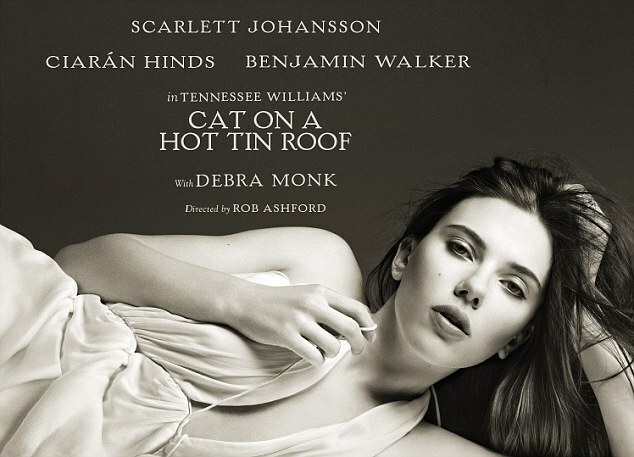 I had read it in college and found it to be no "Glass Menagerie" or certainly "A Streetcar Named Desire", for my money Williams two true masterworks, but at the request of the wife to see Scarlett Johansson play Maggie the Cat, I would give the play and its gifted author its rightful due. Needless to say, Johansson, much like Elizabeth Taylor, who made the role famous in the film adaptation three generations removed, exudes a primal sexuality that has less to do with talent, training or guile, but pure biology. Her voluptuous draw had the theater packed with twenty-somethings clamoring to share airspace with the star and none seemed to be prepared to absorb Williams' cruel truths, a perfect blindside that any writer drools over. The poor bastards never knew what hit them. Williams' best work, of which now after being thoroughly moved by this staging, I am fully willing to admit that "Cat On A Hot Tin Roof" is included, deals in his key central theme of living a lie in order to assimilate into an alien existence not of his characters making. This inevitably leads to Williams other pressing themes of violence due to either creeping madness brought on by this charade or alcoholism, which either expedites the madness or quells the rush of its inevitability. All insights into Williams' homosexuality in a mid-twentieth century southern milieu of intolerance, bigotry and machismo, along with the schizophrenia suffered by his beloved sister Rose, and the violent outbursts of an age when alcohol fueled the desires of a repressed nation are all on display with a relentless vigor in Cat on a Hot Tin Roof. The play's debut in 1955, the height of America's last purely conservative moral levee, hinted at Williams' original theme-scape, but failed to bellow it; as if the words only broached the subject like a slight tap on the shoulder instead of the swift punch to the jaw that unfurls now. The three-act version today is Williams' 1974 re-write, which many of the freedoms the post-Sixties cultural shift and the Seventies individuality explosion inspired. It bears only a minor resemblance to the famous film with Taylor and Paul Newman of 1958. Ironically, it was infamous director Elia Kazan who neutered its thematic force. Kazan had lived his own life of ignominious duality when informing on wrongly accused colleagues to the absurdly unconstitutional House Committee On Un-American Activities when he himself was a communist. Having achieved enormous success with the quintessential film adaptation of "A Streetcar Named Desire" starring a young and sexually charged Marlon Brando in 1952, Kazan subjugated Williams' crucial expressions for a Hollywood squeezed by the strangely powerful Motion Picture Production Code, enacted in 1934 and later abandoned in 1968 at the dawn of the golden age of modern film. Kazan, also having directed the original Broadway staging, cajoled Williams into toning down the striking language of the play to avoid the obligatory blowback subjected to works of the time. The fury of Williams' boomerang effect is palpable in this staging, as Johansson, feverishly bawdy, stomps around in nothing but a slip for half the performance, taught in sexual frustration and cunning manipulation, taunts her crippled husband (both physically with an ankle injury and mentally in the throes of an alcohol stupor) with wild abandon. She lends proper voice to Williams' incongruities of a dying post-war southern motif filled with land barons, heirs, belles and debutantes trolling their children around like trophies. Her husband, ably but not strongly portrayed by a handsome Benjamin Walker, acts as Williams' whipping boy; both characters providing insight into the author's tortured psyche. The play, however, is abducted by the work of veteran British actor, Ciarán Hinds, whose outstanding turn as Julius Caesar in HBO's Rome a few years back put him on the map. Hinds, as Big Daddy, the patriarch of a Tennessee Valley cotton empire, seethes with regret and disgust for his life, family and station. He is the play's philosophical weathervane; vulgar and unwavering with nary a stitch of societal affectation brimming in every other character in the piece, pushing the others to confront their hypocrisy as he shouts "Liars! Liars!" at them all. Stricken with cancer, although he has been deceived by his doctor that he is safe to enjoy his 65th birthday, Hinds' Big Daddy tries in vain to save his son from the slow suicide of drink the young man believes he must pursue due to his pangs of guilt over the death of a close friend whose homosexual advances he had to refuse, which in the end led to his friend's death. It is a riveting performance. Mostly, though, it is Tennessee Williams who breathes again in this loud, brash and concussive revival of a story best known for its wounding due to censorship, but spins back with ever-threatening speed to assail us once again.